This MVP Proton Nano Mini sports a Skulboy Design, Skull Kid with Eyeball, created by artist Duncan Crawford with gritty skull inspired, comic book, monster-movie-like dark fantasy characters. The MVP Proton Nano Mini is a mini marker disc suitable for playing mini disc golf or as a marker in competitive disc golf. It bears the same premium quality, aesthetics, and high production standards as MVP golf discs in half the diameter. Mark your lie in style, and reinforce that all-important confidence in your plastic. For those who enjoy throwing mini discs, the Nano has a versatile straight-stable flight that can be used for low-power indoor throws as well as high-power outdoor throws. The Nano is a must-have for every MVP thrower. Available in Proton, Eclipse, Neutron and Plasma plastic. Skulboy Designs - created by artist Duncan Crawford for the world of disc golf. 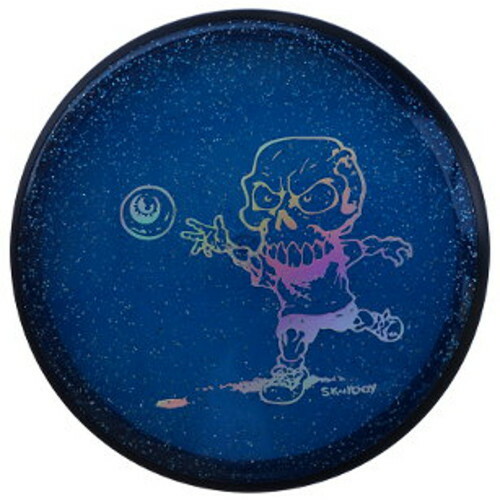 As a sculptor for TV and movie sets, a long-time black and while illustrator and a disc golf enthusiast, Skulboy has made his mark on the sport with discs stamped with his gritty skull inspired, comic book, monster movie like dark fantasy characters.